use left and right arrows. The first method is to test if the current DisplayObject3D is hitting a point in the scene and the second one is to detect if the current object is hitting another DisplayObject3D in the scene. This is quite similar to the display architecture used by flash and its DisplayObject the difference is when we have a main DisplayObject3D with other objects 3D as childs. In that case we would be tempted to use hitTestObject assuming that the collision test will be tested using the parent DisplayObject3D and their childs but that is wrong. A few weeks ago I made some modifications to the Zeus Lab particle system for Actionscript made by Josh Tynjala . The Josh’s particle system is neat, simple and if you combine the particle system with the use of filter you can obtain beautiful visual effects. 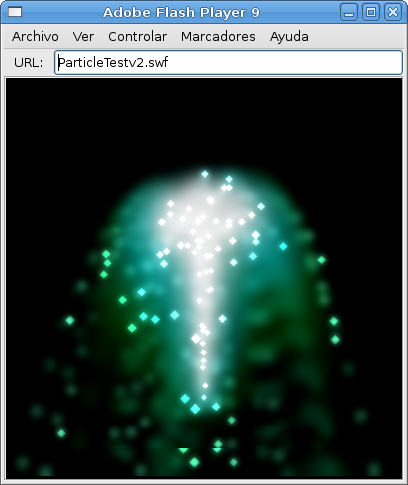 I wanted to continue using it while experimenting with Papervision, the only problem is that it is 2D, so I made the port of the particle system to make it usable in a 3D environment, the result was some kind of distribution of the particle system because I didn’t touch the 2D code I only extended to be usable with the display architecture and classes in PV3D.